Not to be confused with the Anschluss, when Nazi Germany annexed Austria. Territory claimed by German-Austria. The border of the subsequent First Republic is outlined in red. Map indicating the German-speaking areas (red) within the Austro-Hungarian Empire as of 1911. Twenty-heller German Austrian newspaper stamps from 1920. One-krone banknote, overprinted with the name Deutschösterreich ("German-Austria"). The Republic of German-Austria (German: Republik Deutschösterreich or Deutsch-Österreich) was a country created following World War I as the initial rump state for areas with a predominantly German-speaking population within what had been the Austro-Hungarian Empire. German-Austria demanded an area of 118,311 km², with 10.4 million inhabitants in the area of the present-day Republic of Austria and other areas where most ethnic Germans lived. 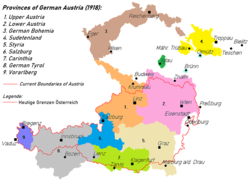 In Habsburg Austria-Hungary, "German-Austria" was an unofficial term for the areas of the empire inhabited by Austrian Germans. On 12 October 1918, Emperor Charles I met with the leaders of the largest German parties. German Nationalists wanted a constitutional monarchy of free nations; Christian Socialists wanted to maintain monarchy and a federation of nations; Social Democrats wanted a republic that would either be a part or federation of nations or join Germany. On October 16, 1918, Emperor Charles I published a manifesto which offered to change Austria-Hungary into a federation of nationalities. This came too late as Czechs and Southern Slavs were well on their way to creating independent states. However, this gave an impulse to the Reichsrat of German-inhabited areas to meet. With the impending collapse of the empire the 208 ethnic German deputies to the Cisleithanian Austrian parliament (Reichsrat) elected in 1911 met on 21 October 1918 and proclaimed itself to be a "Provisional National Assembly for German-Austria" representing the ethnic Germans in all Cisleithanian lands. It elected Franz Dinghofer of the German National Movement, Jodok Fink of the Christian Social Party, and Karl Seitz of the Social Democratic Workers' Party as assembly presidents. The assembly included representatives from Bohemia, Moravia, and Austrian Silesia who refused to submit to the new state of Czechoslovakia which had been declared on 28 October 1918. It also proclaimed that "the German people in Austria are resolved to determine their own future political organization to form an independent German-Austrian state, and to regulate their relations with other nations through free agreements with them". On October 25 Provisional Assembly called on all German inhabited Lands to form their own provisional assemblies. During its second meeting on October 30, the Provisional National Assembly created the basic institutions of the new state. The legislative power was assumed by the Provisional National Assembly while the executive power was entrusted to the newly created German-Austrian State Council. On 11 November 1918, Emperor Charles I in all but name abdicated, by relinquishing his right to take part in Austrian affairs of state. The next day, 12 November, the National Assembly officially declared German-Austria a republic and named Social Democrat Karl Renner as provisional chancellor. On the same day it drafted a provisional constitution that stated that "German-Austria is a democratic republic" (Article 1) and "German-Austria is an integral part of the German republic" (Article 2). The latter provision reflected the deputies' view that felt that Austria would lose so much territory in any peace settlement that it would no longer be economically and politically viable as a separate state, and the only course was union with Germany. This was enforced by the refusal of Hungary to sell grain and of Czechoslovakia to sell coal to Austria-Germany. As the Empire collapsed and a ceasefire was announced, the Provisional Assembly sought to forestall socialist revolution by organizing a coalition government led by the minority Social Democrats. Karl Renner became Chancellor and Victor Adler became Foreign Minister. The Social Democrats co-opted newly created soldier and worker councils and used their control over labour unions to implement social policies that blunted the socialist appeal. Elections to the Constituent Assembly were held on February 16, 1919 and for the first time women were allowed to vote. Out of the 38 German inhabited constituencies only 25 participated and 159 deputies were elected to the 170 seats with Social Democrats as the largest party. Social Democrats won 72 seats, Christians Socials 69 and German Nationalists 26. The Constituent National Assembly first met on 4 March 1919 and on 15 March a new government was formed, once again led by Karl Renner. Austrian Social Democrats, despite being one of the leading Marxist parties with its Austromarxism current, did not attempt to seize power or to institute socialism. However, the majority of conservative, Catholic politicians still distrusted them and this led to the fatal left-right split that plagued the First Republic and led to its downfall by 1934. Social Democrat leader Otto Bauer wrote: "German-Austria is not an organism which has followed the laws of historical growth. It is nothing but the remnant of what remained of the old Empire after other nations had broken away from it. It remained as a loose bundle of divergent Lands." On 13 November 1918, German-Austria asked Germany to start negotiations of union and on 15 November sent a telegram to President Wilson to support union of Germany and Austria. This was grounded in the view that Austria had never been a nation in the true sense. While the Austrian state had existed in one form or another for over 700 years (dating to the Holy Roman Empire), its only unifying force had been the Habsburgs. Apart from being German-inhabited, these Lands had no common "Austrian" identity. They were Habsburg-ruled lands that had not joined the Prussian-dominated German Empire after the Austrian Empire lost the Austro-Prussian War. On 12 March 1919, the Constituent Assembly re-confirmed an earlier declaration that German-Austria was a constituent part of the German republic. Pan-Germans and Social Democrats supported the union with Germany, while Christian Socialists were less supportive. During spring and summer of 1919, unity talk meetings between German and Austrian representatives continued. All this changed after 2 June 1919 when the draft peace treaty with Austria was presented, which demonstrated that the Western Allies were opposed to any union between Germany and Austria. After submitting a formal note of protest to Allies against blocking German-Austrian union, on 10 September 1919 Renner signed the Treaty of Saint Germain and it was ratified by the Constituent National Assembly on 17 October. According to its provisions, on 21 October the country changed its name from "German-Austria" to "Republic of Austria". It also lost the Sudetenland and German Bohemia to Czechoslovakia, South Tyrol to Italy, and southern Carinthia and Styria to Yugoslavia. Article 88 of the treaty, sometimes called a "pre-Anschluss attempt", stated that "the independence of Austria is inalienable otherwise than with the consent of the Council of the League of Nations. Consequently Austria undertakes in the absence of the consent of the said Council to abstain from any act which might directly or indirectly or by any means whatsoever compromise her independence, particularly, and until her admission to membership of the League of Nations, by participation in the affairs of another Power"—in effect, barring any attempt by Austria to unite with Germany. Likewise, the Treaty of Versailles, dictating the terms of peace for Germany, forbade any union between Austria and Germany. With these changes and the settling of Austria's frontiers, the era of the First Republic of Austria began. German-Austria claimed sovereignty over all the majority-German territory of the former Habsburg realm: a total area of 118,311 km2 (45,680 sq mi) with 10.4 million inhabitants. This included nearly all the territory of present-day Austria, plus South Tyrol and the town of Tarvisio, both now in Italy; southern Carinthia and southern Styria, now in Slovenia; Sudetenland and German Bohemia (which later became part of Sudetenland), now in the Czech Republic and East Silesia (now divided between Poland and Czechoslovakia). 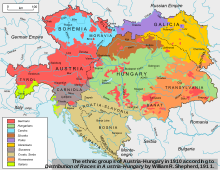 In practice, however, its authority was limited to the Danubian and Alpine provinces of the old Habsburg realm—with few exceptions, most of present-day Austria. On 22 November, the national assembly officially laid claim to all ethnic German areas of Cisleithania. However, the Allies of World War I opposed such a move and German-Austria was largely powerless to resist the forces of Italy, Czechoslovakia, and the Kingdom of Serbs, Croats, and Slovenes from seizing some of its territory. Countries on the winning side of the war took many territories with German majorities. The Czechs ignored principles of ethnic borders and insisted on the historic borders of the Kingdom of Bohemia; thus three million Germans became Czechoslovak citizens, an indirect precipitant of the Sudetenland crisis 20 years later. A victor nation, Italy occupied and was awarded Trentino and South Tyrol, of which South Tyrol is still majority German-speaking. Yugoslavia was given parts of Carinthia and Styria. The Klagenfurt region was retained after a plebiscite on 20 October 1920, when three-fifths of voters voted to remain with Austria. Later plebiscites in the provinces of Tyrol and Salzburg yielded majorities of 98 and 99% in favor of a unification with Germany whereas Vorarlberg in May 1919 held a plebiscite where 81% supported accession to Switzerland. Several German minority populations in Moravia, including German populations in Brünn (Brno), Iglau (Jihlava) and Olmütz (Olomouc), as well as the German enclave of Gottschee in Carniola also attempted to proclaim their union with German-Austria, but failed. The areas now outside of the current Republic of Austria often had significant non-German minorities and occasionally non-German majorities and were quickly taken by troops of the respective countries they were to eventually join. Regarding East Silesia, plans for a plebiscite fell through, and the area was divided between Czechoslovakia and Poland. On the other hand, ethnic Germans in the western part of the Kingdom of Hungary that formed a majority in the area known as German West Hungary and agitated to join to Austria were successful and the area became the state of Burgenland, with the notable exception of the region around the city of Ödenburg (Sopron) which was also intended to be the state capital, but due to a very contentious plebiscite, remained part of Hungary. The only other part of the former German counties of Burgenland in the Kingdom of Hungary also not to become part of the Austrian Republic due to the treaty was Preßburg (Bratislava) which went to Czechoslovakia (now the capital of Slovakia). Sudetenland, parts of the historical regions of Moravia and Austrian Silesia. Boundaries do not correspond to later use of the term Sudetenland. Vorarlberg, all of the current Austrian state of Vorarlberg. Despite the prohibition of the use of the term "German-Austria", the republic's unofficial national anthem between 1920 and 1929 was "German Austria, you wonderful country" (Deutschösterreich, du herrliches Land). Its words were penned by then-Chancellor Karl Renner, a signatory of the Treaty of Saint Germain. ^ Barker, Elisabeth (1973). Austria 1918–1972. Palgrave Macmillan UK. p. 4. ISBN 978-1-349-01429-3. This page was last edited on 18 April 2019, at 00:41 (UTC).